In our imaginations, Gringotts is the quintessential bank. It is well constructed, has vaulted hallways and is full of gold. When you want to explain to a young reader with little experience of financial affairs roughly what a bank is (as Rowling did), you would say it is a safe place to put your money, accessible when required. As Hagrid quipped, ‘yeh'd be mad ter try an' rob it’. But does Gringotts fulfil the roles of a financial institution as we would understand it today? That is to say; does it serve the wizarding community by efficiently allocating their capital, earning income (i.e. via interest) in the process? Do wizards even need a conventional financial institution, or are they happy with a very large vault to hold their gold coins? Financial institutions allocate capital by transferring money from lenders (i.e. the bank’s depositors), who have less immediate need for it, to borrowers, who have more immediate need for it. The ‘techy’ term for this is credit creation and it is most commonly achieved via the loan system, residential mortgages being the best-known example here. Borrowers pay a higher rate of interest, lenders receive a lower rate, and the bank takes a cut. Credit creation should boost economic growth by allowing value-enhancing projects to occur more quickly than they otherwise would have done (imagine how long it would take you to save for a house before you could buy it outright! ), and it is a signal of confidence in the economy. Along with such things as an independent legal system and an exchangeable currency, credit creation is considered a cornerstone of modern economics. Do the Weasleys need a mortgage? If wizards could use magic to make anything, then presumably they would not need money. They could ‘magic’ all their required items and so scarcity would not exist. The absence of scarcity would also render unnecessary the study of economics (err…yay? )** as the study of choice optimization in a world of limited resources. In the Potterverse, scarcity still exists. Rowling tells us it is so via Gamp’s law, which essentially says that you can’t make something out of nothing. So we can assume that magic, like technology, acts as an enhancer to underlying economic fundamentals. It can accelerate and polish, but it cannot add or remove. Wizards, therefore, must work for a living (cue niche jobs such as quidditch players and curse breakers). It also follows that their wants and needs are not satisfied by their current incomes because if they were, the Weasley children would not need to buy second-hand school books. So there is demand for credit in the Potterverse, which probably means that the Burrow (the Weasleys’ house) has a 95% Loan-to-Value mortgage. Such high ‘leverage’ would be problematic for the Weasleys if they couldn’t cover their interest and capital installments, the consequences of which we are all familiar with given recent economic history. Clearly Gringotts makes an income, how else can is Goblin owners pay their staff and feed those massive dragons? They would probably earn some income from vault fees, and from the actual process of minting coins (called Seigniorage, basically 'taking a cut off the top'). 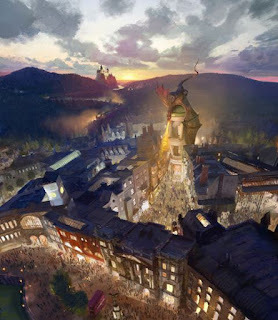 However, in an economy where Gringotts is a state-sanctioned monopoly over a critical industry, it seems likely that the Goblins would engage in credit creation if there were demand for it. The rewards would be too lucrative to miss! Indeed Rowling gives us one example of money-lending in the Potterverse, where Ludo Bagman (the Tri-Wizard cup organiser) borrows money from the Goblins at an usurious rate for gambling activities, in what looks to be the first wizarding payday loan. Nonetheless wizards don’t seem to be overly fond of banking; otherwise they would presumably manage Gringotts themselves. What's with all the gold coins? In the real world, the money supply problem was historically solved by banks issuing their own notes, backed by the gold or other assets they had in their vaults. The process was eventually transferred to central banks to prevent over-issuance of notes (thus leading to inflation). Scottish banknotes are a hangover of this old practice, although today they are bound by the Bank of England’s monetary policies. It seems likely then that Gringotts follows a similar process. They must either make coins when they need them to lend, or they must issue notes backed by the Galleons in their vaults. But as we said, Rowling tells us that you can't make something from nothing, and mining gold must be time-consuming even for magical beings like Goblins. Credit creation, on the other hand, needs to be immediately responsive to consumer demand. So when the Weasley children need new school books, they don’t have time for the Goblins to mint some new coins. A better banking solution would be for the Goblins to loan them some pre-existing Galleons from say, Harry's vault, and replace those with a note that says 'Gringotts owes the bearer of this note (currently Harry) X amount of Galleons'. And if Harry were willing to take that note instead of Galleons buy a new Firebolt broomstick, and it was then used by the Quidditch shop to pay their suppliers and so on, then the note has been accepted as a medium of exchange. In other words, it is money too! Exchanging confidence for notes...now what’s the spell for that? Creditum facere? PS - I am aware that there are a lot of technical arguments around credit creation, its inflationary effects and whose responsibility it ultimately is etc (Central Bank vs commercial banks), which I didn't have a chance to address here so please excuse any omissions. ** Response of Economics undergraduates when polled on this issue. ***Contact me if you would like an explanation of how this process, called Fractional Reserve Banking, works using zero technical terms! This is part two of a poponomics series on 'Potternomics'- the economics of Harry Potter. Check out the first part here. Today is the EU Referendum!